This page contains information on ordering bulk suscriptions for retail outlets. For individual subscriptions, please go to subscribe.theonion.com. To order back issues of the print edition, please use the Back Issues Order Form. 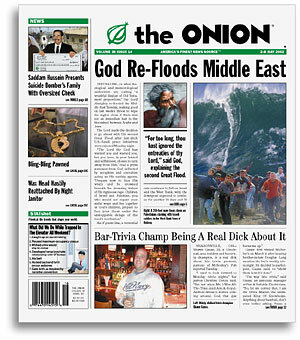 The Onion is available at Borders, Barnes & Noble and Hastings stores nationwide. In Canada, The Onion can be found at Chapters or Indigo stores, as well as on many independent newsstands. Contact the periodicals manager at your favorite newsstand or book store for information on availability in your area. How can I sell The Onion at my store or institution? Any questions/comments regarding national/bulk distribution of The Onion should be directed to Onion Distribution. Is the newspaper available in my area? Use the STORE LOCATOR below to find the nearest bookstore carrying America's Finest News Source. When you find a store near you, use the contact information to confirm that The Onion is in stock. The Onion® is not intended for readers under 18 years of age.